To Cite: Rahimian Boogar I, Talepasand S, Norouzi H, Mozafari S, Hosseini S J. The Prediction of Colorectal Cancer Screening Based on the Extended Parallel Process Model: Moderating the Role of Health Literacy and Cancer-Related Empowerment, Int J Cancer Manag. 2018 ; 11(6):e62539. doi: 10.5812/ijcm.62539. Background: The aim of this study was the prediction of colorectal cancer screening based on the extended parallel processing model regarding the moderating role of cancer-related literacy and cancer-related empowerment. Methods: In a cross sectional survey, 366 participants among individuals who attended to the specialized internal clinics of Semnan, Iran were selected by convenience sampling. The participants completed the assessment of colon cancer literacy, health education impact questionnaire, colorectal cancer screening questionnaire, colorectal cancer screening decision quality instrument, and demographic checklist. Finally, the data were analyzed with descriptive statistics and structural equation modeling, using SPSS-20 and LISREL 8.8 software. Results: The final model was approved and the model had a good fitness of the data observed. Perceived susceptibility, perceived self-efficacy, and perceived response efficacy indirectly predicted defensive avoidance through cancer-related literacy (P < 0.05). Perceived severity and perceived response efficacy indirectly predicted defensive avoidance through fear of cancer (P < 0.05). Perceived susceptibility and perceived response efficacy indirectly predicted defensive avoidance through health-related empowerment (P < 0.05). In addition, the effect of perceived self-efficacy on the fear of cancer was non-significant (P > 0.05) and perceived severity had a direct effect on the defensive avoidance (P < 0.05). Conclusions: It is concluded that designing the tailored health-promoting programs is crucial to improve perceived self-efficacy, perceived response efficacy, cancer-related literacy, and health-related empowerment for engagement to the colorectal cancer screening. In addition, decreasing or controlling the fear of cancer, perceived susceptibility, and perceived severity, as leading causes of defensive avoidance in colorectal cancer screening, is important. Colorectal cancer is the third most common cancer worldwide and it is the second most common factor for death by cancer (1-3). The incidence of colorectal cancer, as a main health concern, is increasingly rising in Iran (4). The timely and proper colorectal cancer screening is a leading factor to reduce incidence and consequences of this disease. Interventions for disease prevention are designed based on theories of engagement in health behaviors. The extended parallel processing model is a main theory in health behavior change (5-7). The extended parallel processing model is based on the belief that when people are afraid of a threat, they take actions to reduce or control those unpleasant scenarios (7). In the extended parallel processing model, perceived susceptibility is an important motivating factor in many healthy behaviors and disease screening. Perceived susceptibility directly and indirectly influence the attitudes, self-efficacy, and intent to behaviors (8). The empowerment in cancer prevention and cancer treatment is the positive, dynamic, and multidimensional concept (9, 10). The empowerment helps to prevent cancer and it encourages screening to reduce cancer incidence (11). Health literacy includes the person’s ability to read and interpret the necessary information about health so that they can take appropriate decisions for their health conditions. By interacting collaboratively, Health literacy and empowerment impact the screening, diagnosis, and consequences of cancer (12-14). Despite the high rate of deaths from cancer, cancer screening is less than health objectives for 2020 (15). Lack of cancer-related literacy and knowledge about cancer and cancer screening are among the primary barriers of cancer screening (16). Fear of cancer and cancer risk perception are main predictors for plans and actions of cancer screening test (17, 18). On the other hand, the extreme fear of cancer is associated with avoiding cancer screening (19). The combination of low socioeconomic conditions, poor health, diminished social support, and low health literacy affect the intention to colorectal cancer screening (20-22). Race, ethnicity, age, education, income, access to health care, recent meetings with doctors, the use of other screening tests, doctor’s recommendation for testing, and insurance coverage are the main correlates of colorectal cancer screening (6, 23, 24). Having adequate health literacy is associated with the colorectal cancer screening (25, 26). Higher self-efficacy, previous participation in cancer screening, and more knowledge about colorectal cancer were known as the independent predictors of a plan to colorectal cancer screening (27, 28). The lower levels of health literacy and poor socioeconomic status are associated with a higher perception of severity of the disease and medical testing avoidance (29, 30). Higher perceived risk of colorectal cancer incidence increase engagement in screening tests (31). In addition, the association between perceived susceptibility and perceived severity with cancer screening mediated by cancer-related literacy (32). 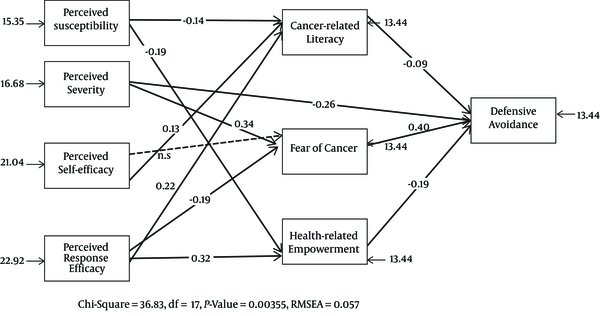 Cancer-related literacy, fear of cancer, and cancer-related empowerment moderate the relationships of self-efficacy, response efficacy, perceived severity, and perceived susceptibility to disease with the cancer screening (16, 33). Health literacy may empower individuals, which in turn lead to increased understanding of the disease and perform screening tests (34). Perceived susceptibility is mediated by barriers and perceived self-efficacy and impacts the colorectal cancer screening with the mediation of factors, including fear of cancer and empowerment (9, 35). There is no integrated model that can examine the main components associated with colorectal cancer screening. Theoretically, this model has been developed based on the related previous models by Birmingham et al. (33), Leung, Wong and Chan (6), Shi and Smith (8), Leung et al. (18), and Power et al. (21). In previous studies, the fear of cancer in the prediction of information seeking and screening intent has been less studied. In addition, although cancer risk and cancer risk perception are expected to be negatively affected by the avoidance of cancer data acquisition, this relationship is not empirically verified. As main gaps in previous studies, lack of attention to the empowerment and health literacy in colorectal cancer screening is another weakness of previous research. This study in the integrated and relatively comprehensive model provides an understanding of the role of health-related empowerment in cancer and health literacy in predicting the screening of colorectal cancer. Finally, this study investigates an exploratory model regarding the distinctive culture of Iran to explain the colorectal cancer screening. Considering the theoretical foundations and the effect of the parallel process model of health-related behaviors, the aim of this study is the prediction of colorectal cancer screening based on the extended parallel processing model with regard to the moderating role of cancer-related literacy and cancer-related empowerment as presented in a hypothetical structural model (Figure 1). The present study is a retrospective cross sectional design. The statistical population included individuals, who were referred to the private internal clinics of Semnan from March to May 2016. The statistical sample consisted of 366 participants among 20 to 55-year-old selected by the convenience sampling. The sample size was determined based on the parameter estimation (ratio about 1:15) in the structural model, items per latent variable, and sampling requirements for structural equation analysis (36). Therefore, 366 participants (133 males and 233 females) were selected among those admitted to the specialized internal clinics. Participants initially included 402 people; after the execution of the study, 36 people were excluded on the basis of exclusion criteria. Finally, the findings of 366 participants were analyzed in this study. The inclusion criteria included age among 20 to 55-year-old, asymptomatic individuals or general outpatient with attendance to internal specialized clinics, having literacy at the reading and writing level, and willingness to participate in the study. The exclusion criteria included known genetic susceptibility syndromes (e.g., FAP, Lynch Syndrome), individuals with the history of inflammatory bowel disease, individuals with family or personal history of colorectal cancer, inpatients and those suffering from chronic diseases by medical records and diagnosed by physicians (e.g. cardiovascular, diabetes, other cancers), those with serious psychiatric disorder by psychiatric records and psychiatrist (e.g. schizophrenia, bipolar, major depression), and those who did not complete the study instruments. The assessment of colon cancer literacy (ACCL) is a self-report questionnaire designed by Pendlimari et al. (37) and it includes basic information about definitions related to cancer, malignancy, metastasis, and extension therapies. The ACCL composed of 10 items with triple answers, including “True”, “False”, and “Unsure” (37). The items of the ACCL included outbreaks of disease, causes of the disease, surgical management, other cancer moderators such as chemotherapy and radiotherapy, and terminology such as pervasive, severe, and metastasis. The scores range in the ACCL was from 0 to 10. The sensitivity and specificity of the ACCL to indicate limited health literacy was 91.3% (excellent) and 34.2% (acceptable), respectively (37). Spearman’s correlation coefficient of 37.5% was obtained between Newest Vital Sign (NVS) and ACCL (37). The Cronbach’s alpha of the instrument that calculated in this study was 0.93. The health education impact questionnaire (heiQ) was developed by Maunsell et al. (38) to assess the health literacy about cancer. This questionnaire contains 25 items, designed to determine the effects of health literacy program on self-management of patients with chronic pain. The heiQ has 5 factors, including social integration and support, health service navigation, constructive attitudes and approaches, skill and technique acquisition, and emotional distress (reverse-scored), which are the key aspects of cancer-related empowerment. The questionnaire is scored on a Likert-type scale from 1 (strongly disagree) to 4 (strongly agree), and higher scores indicating more empowerment on a given factor. In the study conducted by Maunsell et al. (38), the correlations of the latent factors in the heiQ ranged from 0.38 to 0.78 and the Cronbach’s alpha for the factors ranged from 0.75 to 0.90 (39). The internal consistency with Cronbach’s alpha in this study was 0.89. The colorectal cancer screening questionnaire was designed by Birmingham et al. (33) to investigate the individuals’ willingness to perform screening tests for colon cancer. This instrument contains 25 items, assessing 4 factors, including perceived efficacy, perceived threat, fear, and defensive avoidance. The perceived threat and perceived efficacy factors were assessed through the 16-item related to the risk behavior diagnosis and efficacy for changing them. The perceived threat and perceived efficacy scored on a 5-point Likert-type scale (1 = strongly agree to 5 = strongly disagree). The factor of fear was assessed through 6 items related to the negative affect on the cancer risk beliefs that scored on a 4-point Likert-type scale (1 = strongly agree to 4 = strongly disagree). The defensive avoidance was assessed through 3 items referring to the colorectal cancer screening and/or colonoscopy and it scored in a 7-point Likert-type scale ranging from1 (I didn’t want to think about it) to 7 (I wanted to think about it). Latent variable correlations for these factors were significant and those ranged from 0.26 to 0.58 (33). The Cronbach’s alpha coefficients for the factors of this instrument ranged from 0.79 to 0.94 (33). Cronbach’s alpha in this study was for all factors from 0.84 to 0.96. The colorectal cancer screening decision quality instrument (CRC-DQI) is constructed by Sepucha et al. (39), containing items about individuals’ total knowledge and individual goals and concerns. The CRC-DQI has 10 items and higher scores in this instrument make better decision quality for colorectal cancer screening. Sepucha et al. (39) indicates that the knowledge score discriminates between those with a decision aid (84%) and those without a decision aid (64%) and it discriminates between healthcare providers (89%), online patients (74%), and clinic patients (41%). This instrument has strong content validity and discriminant validity and test-retest reliability by the intra-class correlation coefficient was to exceed 0.7 (39). The Cronbach’s alpha coefficient of the instrument in this study was obtained as 0.93 (39). The study was conducted in coordination with the specialized internal clinics of Semnan and the individuals referring to the specialized clinic were selected in accordance with healthcare providers and specialists in colorectal cancer. Written informed consent was obtained from each participant in the study and the study conforms to the ethical guidelines of the 1975 declaration of Helsinki. The participants underwent an interview for checking the inclusion/exclusion criteria and, then, completed the study instruments under the carefully monitoring and providing required guidance. Individual implementation method was used and questionnaires were used to control the ceiling and flooring effects to obtain more accurate data through counterbalancing method. This study was conducted regarding the ethical considerations and it was reviewed and approved by the institutional review board (IRB) of Semnan University of Medical Sciences with the Code of Record IR SEMUMS.REC.1396.93. Firstly, the data were analyzed by calculating the descriptive statistics (correlation, mean, standard deviation, and frequency), using SPSS-20 and, next, the data were analyzed with structural equations modeling with LISREL 8.8. The age range of participants was among 21 to 53 years with an age mean (Standard deviation) of 33.47 (6.805). In the demographic data, among 366 participants, 233 (63.7%) were female and 133 (36.3%) were male. Regarding the education level, 26 participants (7.1%) were in the elementary level, 50 participants (13.7%) were in middle school, 137 participants (37.4%) had diploma, and 153 participants (41.8%) had bachelor degree and higher level. Regarding the marital status, 88 participants (24.0%) were single, 251 participants (68.6%) were married, 19 participants (5.2%) were divorced, and 8 participants (2.2%) were widow. Descriptive statistics including mean, standard deviation, correlations, and Cronbach’s alpha coefficients for the variables are shown in Table 1. Abbreviations: CRL, Cancer-related Literacy; DEA, Defensive Avoidance; FOC, Fear of Cancer; HRE, Health-related Empowerment; PES, Perceived susceptibility; PRE, Perceived Response Efficacy; PSE, Perceived Self-efficacy; PSV, Perceived Severity. Firstly, the assumptions of structural equation modeling (SEM) were evaluated. The outliers and normality of the variables were assessed. No outliers were observed. For data normality, when the data are normalized, the skewness and kurtosis calculation is an appropriate index. Skewness and kurtosis should be in the range of +2 and -2. The skewness and kurtosis values for all variables in this study were in the range of +2 and -2. The results of path analysis on the modeling of defensive avoidance, using the perceived susceptibility, perceived severity, perceived self-efficacy, perceived response efficacy, cancer-related literacy, fear of cancer, and empowerment are presented in Figure 2. As observed in the final model (Figure 2), perceived susceptibility indirectly had a negative relationship with defensive avoidance (The path coefficient = -0.09) via cancer-related literacy (The path coefficient = -0.14). Moreover, perceived susceptibility indirectly had a negative relationship with defensive avoidance (path coefficient of -0.19) through health-related empowerment (path coefficient of -0.19). Perceived severity had a direct and negative effect on the defensive avoidance (a path coefficient equal to -0.26). There was also a significant positive path between perceived severity and defensive avoidance (a path coefficient of 0.40) through a fear of cancer (a path coefficient of 0.34). Perceived self-efficacy was indirectly related to defensive avoidance (a path coefficient of -0.09) through the cancer-related literacy (a path coefficient of 0.13). It had been assumed in the initial model that perceived self-efficacy was associated with defensive avoidance through fear of cancer, but this relationship was not proven in the final model and, as a result, it was eliminated in the final model of the path. The perceived response efficacy indirectly had a negative relationship with defensive avoidance (path coefficient equal to -0.09) through cancer-related literacy (path coefficient equal to 0.22) and the perceived response efficacy indirectly had a negative relationship with defensive avoidance (a path coefficient of 0.40) through a fear of cancer (a path coefficient of -0.19). In addition, the perceived response efficacy indirectly had a negative relationship with defensive avoidance (a path coefficient of -0.19) through health-related empowerment (a path coefficient 0.32). The fitness indices of the model are reported in Table 2. The GFI value should be equal to or greater than 0.90. The AGFI value must be equal to or greater than 0.90. A good RMSEA is equal to or less than 0.05. The Chi-square should be more than 0.05. If the NFI index is more than 90%, it is acceptable and is a sign of the model’s fitness. The CFI index is also acceptable for values above 90% (37). The findings indicate that the final model has a good fit (Table 2). Table 3 presents direct effects, indirect effects, and the total effects of the paths. In this study, the higher perceived susceptibility and the cancer-related literacy associated with the lower defensive avoidance and this issue results in the increased tendency to perform screening tests. This finding is consistent with the studies conducted by McQueen et al. (9), Ojinnaka (32), Kobayashi et al. (29), and Sentell et al. (12), which found that having adequate health literacy is related to screening for colorectal cancer. In support of this finding, Atkinson et al. (31) indicate that there is a positive relationship between a higher perceived risk and desire for screening among women at risk of cancer. It is concluded that when a person has higher perceived susceptibility to cancer incidence, and when a person has higher health literacy about diagnostic methods and their effective role in preventing cancer, it will be more likely for them to engage in screening tests. Another finding of the study is that the higher perceived susceptibility and health-related empowerment associated with the lower defensive avoidance and, finally, decreased defensive avoidance leads to increased engagement in screening. This finding is consistent with the studies carried out by McQueen et al. (9) and Birmingham et al. (33), which found that health-related empowerment is effective in participation in the prevention and treatment processes and promotion of the quality of life. This finding is also consistent with studies performed by Luszczynska et al. (11) and Maunsell et al. (38), showing that empowerment was more likely related to medical adherence and performing medical tests. It is argued that when individuals feel empowered and capable of controlling their life’s challenges, this feeling of empowerment will help them increase their autonomy and responsibility to get involved in controlling their health and performing screening for disease prevention. Also, the higher perceived severity was correlated with the lower defensive avoidance and, consequently, with the greater attempts for cancer screening. Shi and Smith (8) found that perceived severity has a strong relationship with the attitudes and intentions for health screening. It argued that the severity of the threat and its consequences were leading factors to perform screening tests. Finding showed that the higher fear of cancer correlated with the greater defensive avoidance and the more reduced cancer screening. This result is consistent with the findings of Power et al. (21), showing that the high levels of fear of cancer are associated with higher avoidance to acquire the needed information related to cancer. Quick et al. (7) believes that when people are afraid of a threat, they are excited to take an action in order to reduce their own unpleasant states. The threat may be reduced through either adaptive or maladaptive behaviors so that the level of risk can be controlled (7). In addition, finding showed the higher self-efficacy and cancer-related literacy associated with the lower defensive avoidance and the greater cancer screening. This finding is consistent with the results of a study conducted by Christou and Thompson (26), which revealed that higher self-efficacy, history of participation in cancer screening, and greater knowledge of colorectal cancer are considered as independent predictors of screening in colorectal cancer. It is argued that higher self-confidence to manage unpredictable and stressful situations and also higher knowledge about how to perform screening tests reduce defensive avoidance and in turn result in better cancer screening. As another result of the study, perceived response efficacy and higher cancer-related literacy decreased defensive avoidance and, consequently, associated with better cancer screening. This finding is consistent with studies carried out by Leung et al. (18), Basch et al. (19), Kobayashi et al. (29) and Adams (30), showing that those with higher or adequate health literacy were more likely to perform screening tests for colorectal cancer. In addition, McQueen et al. (9) indicated that having adequate health literacy is related to more screening for colorectal cancer. Furthermore, Atkinson et al. (31) showed that there is a positive relationship between higher risk perceptions and intend to the screening among women at a risk of cancer. It is concluded that when a person receives positive feedback in healthcare recommendations to cope with the health threats and has sufficient information about the screening tests, s/he has more engagement in the preventive cancer screening. The finding also showed the lower perceived response efficacy and more fear of cancer led to the increased defensive avoidance and, consequently, associated with the decreased cancer screening. This finding is consistent with a study carried out by Shi and Smith (8), showing that the perceived response efficacy is related to defensive avoidance. As noted by Quick et al. (7), higher fear or threat about health conditions may reduce perceived response efficacy and in turn by defensive avoidance result in the limited cancer screening. In fact, cancer screening increases when individuals have positive attitudes about their actions to eliminate the medical threats. Finally, the finding showed that the higher perceived response efficacy and increased health-related empowerment associated with the decreased defensive avoidance and, consequently, related to more screening actions. This finding is consistent with studies carried out by Shi and Smith (8), Leung et al. (18), Kobayashi et al. (29), and Adams (30), indicating that empowered people are better in understanding and participation in cancer screening and more engagement in health promotion. In addition, Luszczynska et al. (11) showed that patients, who are more empowered, are more likely to follow doctors’ recommendations such as adherence to the medications and medical examinations. Moreover, McQueen et al. (40) found that the perceived efficacy is related to the defensive avoidance. It is concluded that health or medical recommendations are followed by positive effects and when a person sees them as being capable of coping with problems and managing them, these conditions associated with more tendencies to get involved in performing medical screening tests. In the final conclusion, the perceived susceptibility, perceived self-efficacy, and perceived response efficacy have indirect effects on defensive avoidance in colorectal cancer screening. In addition, perceived severity has direct and indirect effects on defensive avoidance and colorectal cancer screening. Therefore, it is important for healthcare professionals to consider cancer-related literacy, fear of cancer, and health-related empowerment in designing colorectal cancer screening programs. This study has some limitations. It has been carried out with the participation of the patients attended to the internal specialized clinic of Semnan. So, the generalization of study results to other communities should be done cautiously. The structural equation modeling limits the deduction of causal relationships from these structural relations. In order to use the finding, the authors recommended prioritizing attention to cancer-related literacy, fear of cancer, and health-related empowerment by formulating treatment programs. Besides, it is recommended that future studied focus on the clinical trials for assessing the effectiveness of tailored interventions in these factors for the promotion of colorectal cancer screening. This study was reviewed and approved by the institutional review board (IRB) of Semnan University of Medical Sciences (Code of Record: IR SEMUMS.REC.1396.93). Honored personnel on this institutional review board (IRB) are, hereby, appreciated for their help in this study. In addition, the authors appreciated with the utmost respect for the participants who helped in this study. 1. Jemal A, Siegel R, Ward E, Hao Y, Xu J, Thun MJ. Cancer statistics, 2009. CA Cancer J Clin. 2009;59(4):225-49. doi: 10.3322/caac.20006. [PubMed: 19474385]. 2. Jayasekara H, Reece JC, Buchanan DD, Ahnen DJ, Parry S, Jenkins MA, et al. Risk factors for metachronous colorectal cancer or polyp: A systematic review and meta-analysis. J Gastroenterol Hepatol. 2017;32(2):301-26. doi: 10.1111/jgh.13476. [PubMed: 27356122]. 3. Usher-Smith JA, Walter FM, Emery JD, Win AK, Griffin SJ. Risk Prediction Models for Colorectal Cancer: A Systematic Review. Cancer Prev Res (Phila). 2016;9(1):13-26. doi: 10.1158/1940-6207.CAPR-15-0274. [PubMed: 26464100]. 4. Khosravi Shadmani F, Ayubi E, Khazaei S, Sani M, Mansouri Hanis S, Khazaei S, et al. Geographic distribution of the incidence of colorectal cancer in Iran: a population-based study. Epidemiol Health. 2017;39. e2017020. doi: 10.4178/epih.e2017020. [PubMed: 28774167]. [PubMed Central: PMC5543296]. 5. Pornet C, Dejardin O, Morlais F, Bouvier V, Launoy G. Socioeconomic determinants for compliance to colorectal cancer screening. A multilevel analysis. J Epidemiol Community Health. 2010;64(4):318-24. doi: 10.1136/jech.2008.081117. [PubMed: 19740776]. 6. Leung DY, Wong EM, Chan CW. Determinants of participation in colorectal cancer screening among community-dwelling Chinese older people: Testing a comprehensive model using a descriptive correlational study. Eur J Oncol Nurs. 2016;21:17-23. doi: 10.1016/j.ejon.2015.11.004. [PubMed: 26952674]. 7. Quick BL, LaVoie NR, Reynolds-Tylus T, Martinez-Gonzalez A, Skurka C. Examining Mechanisms Underlying Fear-Control in the Extended Parallel Process Model. Health Commun. 2018;33(4):379-91. doi: 10.1080/10410236.2016.1266738. [PubMed: 28094540]. 8. Shi JJ, Smith SW. The effects of fear appeal message repetition on perceived threat, perceived efficacy, and behavioral intention in the extended parallel process model. Health Commun. 2016;31(3):275-86. doi: 10.1080/10410236.2014.948145. [PubMed: 26305152]. 9. McQueen A, Vernon SW, Rothman AJ, Norman GJ, Myers RE, Tilley BC. Examining the role of perceived susceptibility on colorectal cancer screening intention and behavior. Ann Behav Med. 2010;40(2):205-17. doi: 10.1007/s12160-010-9215-3. [PubMed: 20658212]. [PubMed Central: PMC3161120]. 10. Schmidt M, Eckardt R, Scholtz K, Neuner B, von Dossow-Hanfstingl V, Sehouli J, et al. Patient Empowerment Improved Perioperative Quality of Care in Cancer Patients Aged >/= 65 Years - A Randomized Controlled Trial. PLoS One. 2015;10(9). e0137824. doi: 10.1371/journal.pone.0137824. [PubMed: 26378939]. [PubMed Central: PMC4574984]. 11. Luszczynska A, Durawa AB, Scholz U, Knoll N. Empowerment beliefs and intention to uptake cervical cancer screening: three psychosocial mediating mechanisms. Women Health. 2012;52(2):162-81. doi: 10.1080/03630242.2012.656187. [PubMed: 22458292]. 12. Sentell TL, Tsoh JY, Davis T, Davis J, Braun KL. Low health literacy and cancer screening among Chinese Americans in California: a cross-sectional analysis. BMJ Open. 2015;5(1). e006104. doi: 10.1136/bmjopen-2014-006104. [PubMed: 25564140]. [PubMed Central: PMC4289731]. 13. Bidouei F, Abdolhosseini S, Jafarzadeh N, Izanloo A, Ghaffarzadehgan K, Abdolhosseini A, et al. Knowledge and perception toward colorectal cancer screening in east of Iran. Int J Health Policy Manag. 2014;3(1):11-5. doi: 10.15171/ijhpm.2014.48. [PubMed: 24987716]. [PubMed Central: PMC4075097]. 14. Schulz PJ, Nakamoto K. Health literacy and patient empowerment in health communication: the importance of separating conjoined twins. Patient Educ Couns. 2013;90(1):4-11. doi: 10.1016/j.pec.2012.09.006. [PubMed: 23063359]. 15. Koo JH, Arasaratnam MM, Liu K, Redmond DM, Connor SJ, Sung JJ, et al. Knowledge, perception and practices of colorectal cancer screening in an ethnically diverse population. Cancer Epidemiol. 2010;34(5):604-10. doi: 10.1016/j.canep.2010.05.013. [PubMed: 20580631]. 16. Oh KM, Kreps GL, Jun J. Colorectal cancer screening knowledge, beliefs, and practices of Korean Americans. Am J Health Behav. 2013;37(3):381-94. doi: 10.5993/AJHB.37.3.11. [PubMed: 23985185]. 17. Galal YS, Amin TT, Alarfaj AK, Almulhim AA, Aljughaiman AA, Almulla AK, et al. Colon Cancer among Older Saudis: Awareness of Risk Factors and Early Signs, and Perceived Barriers to Screening. Asian Pac J Cancer Prev. 2016;17(4):1837-46. doi: 10.7314/APJCP.2016.17.4.1837. [PubMed: 27221862]. 18. Leung DY, Chow KM, Lo SW, So WK, Chan CW. Contributing Factors to Colorectal Cancer Screening among Chinese People: A Review of Quantitative Studies. Int J Environ Res Public Health. 2016;13(5). doi: 10.3390/ijerph13050506. [PubMed: 27196920]. [PubMed Central: PMC4881131]. 19. Basch CH, Basch CE, Zybert P, Wolf RL. Fear as a Barrier to Asymptomatic Colonoscopy Screening in an Urban Minority Population with Health Insurance. J Community Health. 2016;41(4):818-24. doi: 10.1007/s10900-016-0159-9. [PubMed: 26831486]. 20. Webb TL, Sheeran P. Does changing behavioral intentions engender behavior change? A meta-analysis of the experimental evidence. Psychol Bull. 2006;132(2):249-68. doi: 10.1037/0033-2909.132.2.249. [PubMed: 16536643]. 21. Power E, Van Jaarsveld CH, McCaffery K, Miles A, Atkin W, Wardle J. Understanding intentions and action in colorectal cancer screening. Ann Behav Med. 2008;35(3):285-94. doi: 10.1007/s12160-008-9034-y. [PubMed: 18575946]. 22. Han MA, Choi KS, Jun JK, Kim Y, Park EC, Lee HY. Factors associated with the intention to have colorectal cancer screening in Korean adults. Eur J Cancer Care (Engl). 2011;20(4):475-82. doi: 10.1111/j.1365-2354.2010.01209.x. [PubMed: 20646036]. 23. Salimzadeh H, Eftekhar H, Delavari A, Malekzadeh R. Psycho-social Determinants of Colorectal Cancer Screening in Iran. Int J Prev Med. 2014;5(2):185-90. [PubMed: 24627745]. [PubMed Central: PMC3950741]. 24. Shariff-Marco S, Breen N, Stinchcomb DG, Klabunde CN. Multilevel predictors of colorectal cancer screening use in California. Am J Manag Care. 2013;19(3):205-16. [PubMed: 23544762]. [PubMed Central: PMC5908983]. 25. Arnold CL, Rademaker A, Liu D, Davis TC. Changes in Colorectal Cancer Screening Knowledge, Behavior, Beliefs, Self-Efficacy, and Barriers among Community Health Clinic Patients after a Health Literacy Intervention. J Community Med Health Educ. 2017;7(1). doi: 10.4172/2161-0711.1000497. [PubMed: 28344855]. [PubMed Central: PMC5362257]. 26. Christou A, Thompson SC. Colorectal cancer screening knowledge, attitudes and behavioural intention among Indigenous Western Australians. BMC Public Health. 2012;12:528. doi: 10.1186/1471-2458-12-528. [PubMed: 22809457]. [PubMed Central: PMC3481427]. 27. von Wagner C, Semmler C, Good A, Wardle J. Health literacy and self-efficacy for participating in colorectal cancer screening: The role of information processing. Patient Educ Couns. 2009;75(3):352-7. doi: 10.1016/j.pec.2009.03.015. [PubMed: 19386461]. 28. Essink-Bot ML, Dekker E, Timmermans DR, Uiters E, Fransen MP. Knowledge and Informed Decision-Making about Population-Based Colorectal Cancer Screening Participation in Groups with Low and Adequate Health Literacy. Gastroenterol Res Pract. 2016;2016:7292369. doi: 10.1155/2016/7292369. [PubMed: 27200089]. [PubMed Central: PMC4855008]. 29. Kobayashi LC, Wardle J, von Wagner C. Limited health literacy is a barrier to colorectal cancer screening in England: evidence from the English Longitudinal Study of Ageing. Prev Med. 2014;61:100-5. doi: 10.1016/j.ypmed.2013.11.012. [PubMed: 24287122]. [PubMed Central: PMC3969575]. 30. Adams RJ. Improving health outcomes with better patient understanding and education. Risk Manag Healthc Policy. 2010;3:61-72. doi: 10.2147/RMHP.S7500. [PubMed: 22312219]. [PubMed Central: PMC3270921]. 31. Atkinson TM, Salz T, Touza KK, Li Y, Hay JL. Does colorectal cancer risk perception predict screening behavior? A systematic review and meta-analysis. J Behav Med. 2015;38(6):837-50. doi: 10.1007/s10865-015-9668-8. [PubMed: 26280755]. [PubMed Central: PMC4628847]. 32. Ojinnaka CO, Bolin JN, McClellan DA, Helduser JW, Nash P, Ory MG. The role of health literacy and communication habits on previous colorectal cancer screening among low-income and uninsured patients. Prev Med Rep. 2015;2:158-63. doi: 10.1016/j.pmedr.2015.02.009. [PubMed: 26844065]. [PubMed Central: PMC4721377]. 33. Birmingham WC, Hung M, Boonyasiriwat W, Kohlmann W, Walters ST, Burt RW, et al. Effectiveness of the extended parallel process model in promoting colorectal cancer screening. Psychooncology. 2015. doi: 10.1002/pon.3899. [PubMed: 26194469]. 34. van der Heide I, Uiters E, Jantine Schuit A, Rademakers J, Fransen M. Health literacy and informed decision making regarding colorectal cancer screening: a systematic review. Eur J Public Health. 2015;25(4):575-82. doi: 10.1093/eurpub/ckv005. [PubMed: 25733553]. 35. Wools A, Dapper EA, de Leeuw JR. Colorectal cancer screening participation: a systematic review. Eur J Public Health. 2016;26(1):158-68. doi: 10.1093/eurpub/ckv148. [PubMed: 26370437]. 36. Mueller R. Basic fundamentals structural equation modeling: introduction LISREL and EQS softwares. NY: Springer-Verlage; 2011. 37. Pendlimari R, Holubar SD, Hassinger JP, Cima RR. Assessment of Colon Cancer Literacy in screening colonoscopy patients: a validation study. J Surg Res. 2012;175(2):221-6. doi: 10.1016/j.jss.2011.04.036. [PubMed: 21737097]. 38. Maunsell E, Lauzier S, Brunet J, Pelletier S, Osborne RH, Campbell HS. Health-related empowerment in cancer: validity of scales from the Health Education Impact Questionnaire. Cancer. 2014;120(20):3228-36. doi: 10.1002/cncr.28847. [PubMed: 24988944]. 39. Sepucha KR, Feibelmann S, Cosenza C, Levin CA, Pignone M. Development and evaluation of a new survey instrument to measure the quality of colorectal cancer screening decisions. BMC Med Inform Decis Mak. 2014;14:72. doi: 10.1186/1472-6947-14-72. [PubMed: 25138444]. [PubMed Central: PMC4147095]. 40. McQueen A, Vernon SW, Swank PR. Construct definition and scale development for defensive information processing: an application to colorectal cancer screening. Health Psychol. 2013;32(2):190-202. doi: 10.1037/a0027311. [PubMed: 22353026].